Believers are BLESSED with every spiritual blessing in the heavenly places! What does that mean? Well, when we, by faith, accept Jesus as our Savior, we receive so much more than salvation! We receive an abundance of blessings! In fact, in the book of Ephesians, there are a total of 54 Spiritual Blessings listed in Chapters 1 thru 3, that believers receive! Memorize this verse! Share it with other believers! Know that in Christ you are BLESSED ! 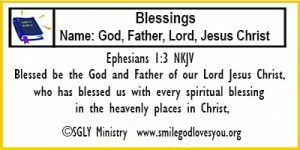 “54 Spiritual Blessings in Christ” as found in the book of Ephesians and read about each blessing you have received as a believer and learn how to walk in each blessing daily. Use this book as a weekly study, there are blank pages for you to journal your thoughts on each blessing. The cost is only $10.00 plus shipping. that our God and Father of our Lord Jesus Christ has blessed us, not only with salvation which is wonderful in itself, but also with every spiritual blessing! Believers, have you ever wondered exactly what this verse means? What is “every spiritual blessing in the heavenly places in Christ”? Well, there is a wonderful book written by our Ministry President, Leona J. Atkinson, titled “54 Spiritual Blessings in Christ” as found in the book of Ephesians that tells us exactly what this verse means, it lists all the blessings and how we can apply all these blessings to our lives daily. It is a devotional/journal that would be a wonderful addition to your home library. So, this verse is a wonderful encouraging verse for all believers to memorize and recall daily. It will encourage us daily to know we are richly and wonderfully blessed! If you would like you can Print the verse out in a card format to post to your refrigerator, bathroom mirror, car visor, or other place that would keep it in your daily vision. It will help to remind you to memorize it as you go through your day and also could be a great tool in sharing with others who might see it. Memorize this verse and walk in its Blessings daily!